The career of Germano Facetti is exceptional in its range. As art director of Penguin Book covers in the 1960s and as a designer, he was a powerful influence on book and information design, throwing a special light on Modern Movement aspirations and on attitudes to illustration. Facetti has maintained the concept of “documentary” and diagrammatic illustration to induce understanding, to express emotion, or to accumulate information in a more memorable way. The pre-history of graphic design is in books, which for centuries have combined text and image. Pioneers of modern typography such as Moholy-Nagy and Lissitzky examined books as a medium of graphic communication. In Britain, where literature was the dominant cultural expression, publishing was a business that maintained the tension between economic success and cultural values. These standards were tested in a mass market in the 1960s by Penguin paperbacks. Germano Facetti, the art director of their covers for more than a decade, embodied both the rational aspirations of the Modern Movement and the wide intellectual culture represented by the books themselves. That Facetti was not a graphic designer in the 1950s is not surprising. Graphic design existed only as “commercial design” – the term coming to supersede “commercial art” – and was thought of in specialisations, such as “advertising design” or “poster design.” Facetti’s first piece of published graphics was a poster in 1955. But it was just one part of the design work that he carried out for an exhibition of industrial design at the Italian Institute in London. With its large photo-mural, the exhibition was Milanese in style; so was the Olivetti London showroom in Kingsway which Facetti designed two years later. The poster, using Bodoni and a cut-out photograph, might have been the work of a number of Milan-based designers such as Max Huber or Albe Steiner. In the early 1950s Facetti joined an evening class in typography at the Central School of Arts and Crafts in London. Run by Edward Wright, it was experimental and anarchic, regularly attended by a few full-time students extending their day, and by an odd assortment of amateurs, including architects, artists, an art historian and an American photographer on a post-military service grant. It was a practical class: printing was done directly from type. The expressive qualities of the individual letterform astonished Facetti, as did the variety and richness he discovered in the alphabet as a whole. Books published by Aldus had single topics of general interest with an educational object, such as Man the Maker or The Wisdom of the West. The text was accompanied by images. These visual documents gave a cultural context to the verbal exposition of the subject. Art editing in this way had begun in magazines. It was a technique adopted by Moholy-Nagy in America for his didactic book, Vision in Motion. This type of book became known in publishing as “integrated” because it replaced the earlier division of the pages into “text” and “plates.” Ironically, extended explanatory captions, the chief feature, had the effect of separating text from image even further. Images make the book attractive, easier to sell, but without intelligent art editing, illustrations and captions become independent of the text, which is in danger of becoming an “optional extra.” When done scrupulously, art direction can illuminate the text, explaining graphically what things look like, and how parts relate to the whole. In the US, Fortune magazine (see Eye no. 2 vol. 1) was the most complete example of the integration of collateral material – such as diagrams and illustrations – with text. As the new medium of television began to rival print media, the image was becoming as important as the word: the graphic designer’s understanding of visual and verbal culture became more significant in all media. After various publishing and teaching jobs in England, Facetti moved to Paris. As an interior designer he worked for the marketing arm of the SNIP advertising agency in Paris, travelling widely to advise on the layout, lighting and point-of-sale material of shops selling Pingouin wools, a detour that was crucial to his subsequent career. Firstly, his experience in selling gave him a particular perspective on retail trading (and it taught him something of the art of persuasion), useful when he returned to Britain as art editor for Penguin Books in 1960. Secondly, Paris formed his attitudes to the image. In London, Facetti’s friends had been young progressive architects; in Paris, at the time when documentary film was a significant genre, Facetti was in the circle of directors which included Alain Resnais and Agnès Varda. He was also a friend of the film-maker Chris Marker, who was then editing the “Petite Planète” book series about different countries. For these directors’ films, still images provided much of the raw material. The way they were used obeyed the Modernist designer’s law of maximum result from minimum means. A photograph could be manipulated through the lens of the rostrum camera; by panning and zooming it could be animated and given meaning by the voice-over commentary. This is the technique of Marker’s La Jetée (on which Facetti collaborated and in which he appears) and of Resnais’ film on Auschwitz, Nuit et Brouillard [Night and Fog]. Facetti regarded Penguin Books as a special British achievement from which he, as a foreigner, had benefited. The nation’s literature, plus books on contemporary issues – scientific and cultural – by the most respected popular and academic authors, as well as classical and foreign writing in translation, were available cheaply and produced impeccably. This was the achievement of Penguin’s founder and managing director, Allen Lane. Lane chose Facetti as his art director mainly because he had designed the Poetry Bookshop in Soho, its ceiling covered with vast portraits of poets, historical and contemporary. Facetti was obviously a book enthusiast who had experience in retail marketing. What faced Facetti at Penguin were several categories of book with only the Penguin symbol as a unifying element. The inside pages of the books were admirably, if conservatively designed, making the most of Monotype and Linotype faces in the general style established by Jan Tschichold between 1944 and 1949, and continued by his successor, Hans Schmoller, who became a Penguin director in 1960. Penguin covers raised crucial questions about the relationship of design to marketing, and the way packaging should (or could) reflect content. Facetti’s overall strategy was to unify the whole of the Penguin cover style. New series proliferated. By the 1960s the Penguin range of titles had swollen (in 1964 Penguin had 2,000 titles available). Existing titles were reprinted in fresh covers. Together with new titles, this could mean as many as 70 covers to be designed in a single month. Facetti’s first move was to tackle the covers of one series. To change “from the typographic to the visual,” he asked three designers to submit proposals for the Crime novels. The chosen design was by Romek Marber. Dividing the cover area by a grid derived mathematically from the old format, Marber retained the horizontal emphasis. For the author and title, Gill capitals were replaced by Standard (Akzidenz Grotesk) in upper and lower case and ranged left instead of centred. The Crime design became the basis for other series, retaining Marber’s subdivision of the space, but using it with remarkable flexibility. Covers were printed by letterpress and the type was included in the designer’s artwork from printed proofs. Helvetica was used increasingly as the typeface became more widely available during the 1960s, and smaller type was sometimes Monotype Grotesque series 215. One of Facetti’s most notable achievements was the new “black” cover design of Penguin Classics. First introduced as a series in 1946, the Classics covers had employed simple, refined typography in centred capitals, punctuated in the middle with a specially commissioned illustration, often a woodcut. Instead of commissioned graphics, Facetti chose images usually from the period of the book’s first publication which identified the book with its historical context. The type remained centred and in capitals, but was in the normal weight of Standard or Helvetica, the author’s name separated by a rule which bled off left and right. 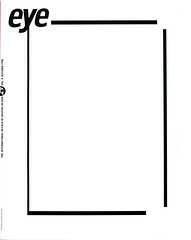 Facetti’s proposal to use black as the background was met with astonished disapproval, so the designer asked for an opportunity to demonstrate the effectiveness of the black covers in selling books. He staked a magnum of Champagne on it and won when a test display, which filled a window of Blackwell’s bookshop in Oxford, prompted an impressive increase in the shop’s Classics sales. Covers for Penguin Modern Classics exemplify Facetti’s belief that a publisher’s corporate identity is an evolution rather than an imposition. Again they derived from the Marber grid and used paintings and drawings contemporary with the book’s period; but they only slowly came to conform to the general Helvetica style, after a stage where the titling was in Eric Gill’s Joanna (at Schmoller’s insistence). Facetti admitted that not all the covers were “thrilling from the point of view of design. It is much more important that Penguin has established a high standard throughout, rather than swinging from very good to very bad, cover to cover, as almost all other publishers do.” Facetti had also stressed the brand image by designing “shops within shops,” dedicated areas in larger book shops devoted exclusively to Penguins. During the 1960s, traditional publishers of hardback books began to set up new paperback imprints. Members of Penguin’s board of directors had different views on how to confront the increasingly competitive market for new fiction. Instead of making the prime selling point the fact that the book was a Penguin they thought the books should be sold as individual titles. When an independent art editor (Alan Aldridge) was appointed for popular fiction covers in 1966, the Penguin identity began to be compromised, the Marber grid abandoned and Facetti’s achievement slowly undermined. During his time at Penguin, which lasted until 1972, Facetti was also busy with other jobs. He was one of the original group to set up the Designers and Art Directors Association (D&AD). He designed their first exhibition in London in 1963. The selected work, mounted and trimmed flush, was displayed on sheets of unpainted shuttering plywood, joined on a hexagonal grid, and easily dismantled for travelling. He designed books for other publishers, including Private View, Lord Snowdon’s photographs of artists in their studios, in 1965. He designed “Cape Editions,” a series of small, narrow-format paperbacks with typographic jackets, mainly translations. Also for Jonathan Cape were “Jackdaws”: folders on specific historical topics which contained reproductions of period documents, images and ephemera, an idea Facetti borrowed from French government education packs, sent monthly to subscribing schools. Facetti also re-designed two weekly magazines, New Society and New Scientist, in 1964 and 1965. These emphasised the structure, separating feature articles from standard weekly columns, allowing art directors freedom for all kinds of illustration. From 1965 Facetti was art director on a huge publishing venture for Robert Maxwell’s British Printing Corporation. Something was needed to use the spare capacity of the new, very large and fast colour web offset presses. Weekly “part-work” magazines were devised to fill this gap, often with topics such as gardening and do-it-yourself. In one of the most successful examples, The History of the Twentieth Century, it was natural for Facetti to combine Aldus Books’ explanatory graphics with the documents and facsimiles of the Jackdaws. He assembled a team of designers to produced statistical diagrams, time charts and maps. “It was easier to reach the mind and the imagination of the reader with graphics,” said A.J.P. Taylor, one of the distinguished academics who supplied the text. Picture researchers sought out documents all over the world. Sixteen issues fitted into a binder to make one volume, and the complete work made up six volumes. Facetti played a prominent role in the graphic design establishment, serving on committees and visiting design schools. For a time he was president of the Alliance Graphique Internationale (AGI). He was co-author, with Pentagram’s Alan Fletcher, of the book Identity Kits, one of the few general accounts of society’s dependence on non-verbal communication, published in 1971, richly illustrated and unjustly out of print. In 1970 he produced Victoria Etcetera, a film on the Imperial statuary on London buildings, using still photographs by Paul Gori. In 1972 Facetti left Penguin. The following year he returned to Italy, working for a number of publishers in Florence, Milan and Rome. Among other books, he was responsible for the design of travel guides to the regions of Italy, but his main achievement was a vast twenty-volume illustrated history of the Italian parliament, completed in 1994. From 1983 he spent some months of each year in the United States, where he was Senior Critic in Graphic Design at Yale. The subject of Facetti’s teaching was the use of images: that the choice of images was a crucial decision, as precise as typographical spacing. It is instructive to compare the book covers produced under Facetti’s art direction with those designed by an earlier teacher at Yale, Alvin Lustig (See Eye no. 10 vol. 3). Where Lustig’s are often imaginative responses to their subject matter, they too often refer gratuitously to the personal interests of the designer, expressed in facile mannerisms borrowed from the European art of their day.